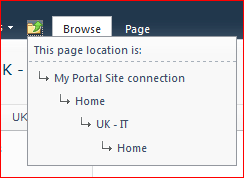 The Portal Site Connection can be a useful way of making your breadcrumbs link to a site collection that is ‘above’ them in the logical architecture of a site. It’s also a good way of navigating out of Search Sites and My Sites – which are kind of navigational black holes. I recently had a customer who wanted a simple web part that just listed the subsites of a site – something like what you see in SharePoint’s “View All Site Content” page, but for a couple of levels, rather than just one. Obviously, this would be quite simple to do directly by traversing the SPWeb object and it’s children, but it struck me that there must be a better, standard way – ideally one that uses a bit of caching or optimisation.